Gartner, Forester and other leading analysts have made it clear that Business Process Management is the most important technology for CIOs to consider in the next few years. In fact, most CIOs around the world have already planned to deploy processes in their organisations using Business Process Management (BPM) this year. Visibility (Everybody can see and understand the process). 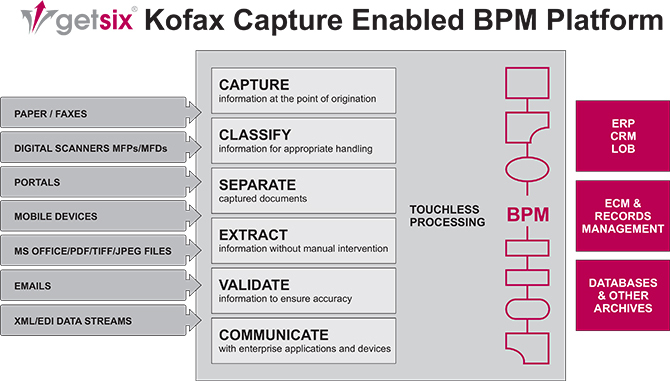 getsix® works with Kofax, one of the leading BPM vendors to apply our 5 ‘D’s methodology for Business Process Management (BPM) deployment and provides solutions for several industries. Every industry can benefit dramatically from effective application of BPM and the following resources will help you get an understanding on how to move ahead. For some organisations, managing software can place enormous demands on already limited IT resources. By outsourcing i.e. the invoice approval management, quality assurance or IT Service management activities of your business, getsix® can dramatically simplify IT management, so you can focus on what you do best. Our outsourced services are designed to provide you with high availability, enhanced security and time-sensitive management of your solutions. This managed approach will enable you to focus on your core business, while benefiting from our professional and high quality services.